The 887 giant moai statues on Easter Island have turned one of the most isolated islands in the world into one of the most well known—and most mysterious. 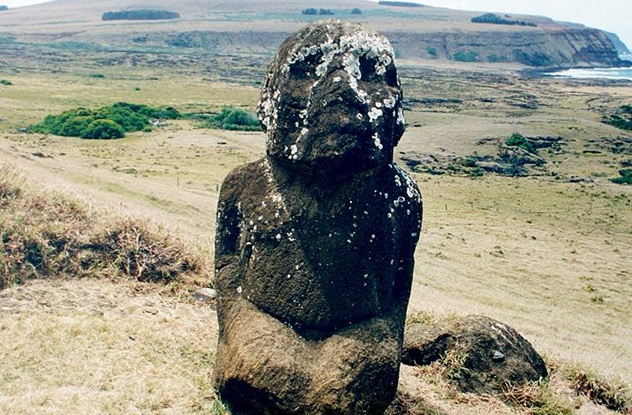 With each year, more theories arise concerning the island, the statues, and the Rapa Nui people who once lived there. Here are some of the most fascinating ones. A longstanding point of contention over the years has been just how the moai statues on Easter Island got to their final resting places. The tallest of the statues, “Paro,” stands at almost 10 meters (33 ft) and weighs in at 74 metric tons (82 tons). All of them are immensely hard to move. In the early ’80s, researchers tried to recreate some of the statues and move them using only tools that the islanders had to their disposal. They found this almost impossible to do. Then in 1987, American archaeologist Charles Love managed to move a 9–metric ton (10 ton) replica. He put it on a makeshift vehicle consisting of two sledges, and he and 25 men rolled the statue 46 meters (150 ft) in just two minutes. Ten years after this feat, Czech engineer Pavel Pavel and Norwegian adventurer Thor Heyerdahl built their own statue of the same size. They tied one rope around its head and another around its base. With the help of 16 people, they rocked the statue from side to side. They cut the exercise short because they were damaging the statue, but Heyerdahl estimated that they could otherwise have moved the statue (or one twice as big) 100 meters (330 ft) per day. Americans Terry Hunt and Carl P. Lipo have recently investigated the sensational theory that the Rapa Nui people tied ropes around the massive moai statues and moved them into place with a walking motion. Their team managed to move a replica 100 meters (330 ft) in this manner. They also argue that this explains Rapa Nui folklore, which tells of the statues walking, animated by magic. A well-known theory states that the island natives cleared large forests to make room for agriculture, mistakenly thinking the trees would grow back fast enough to sustain the environment. The growing population just added to the problem, and the island eventually just couldn’t support its inhabitants. This theory was especially popularized by Collapse: How Societies Choose to Fail or Succeed by UCLA geographer Jared Diamond. Diamond names Easter Island as the most prominent example of resource misuse destroying an entire society. Now, however, a new theory suggests that there is very little evidence this happened. The Rapa Nui people were in actual fact very intelligent agricultural engineers. Intensive study shows that the islanders’ agricultural fields were deliberately fertilized by volcanic rock. Terry Hunt and Carl Lipo, in their continuing study of Easter Island, also theorize that even though the islanders cleared most of the forest, they replaced it with grasslands. The pair do not believe that any self-inflicted catastrophe killed the islanders. Anthropologist Mara Mulrooney supports Lipo and Hunt in the matter. Her radiocarbon data indicates that Easter Island was inhabited for many centuries, and its population only dropped after Europeans started frequenting it. Lipo and Hunt offer an alternative explanation for the population drop. 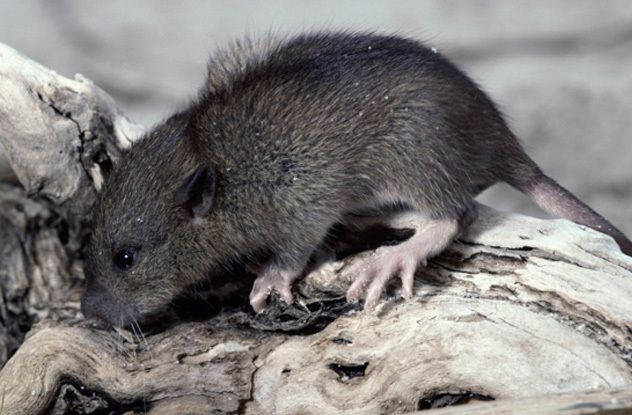 The lack of predators and an overflow of food on the island have provided a paradise for rats hiding in the canoes of the island’s earliest settlers. Though the natives cut and burned trees, it was the rats that prevented regrowth by feasting on the new plants. But while rats may have hurt the island’s ecosystem, they gave the islanders a new food source. The discovery of rat bones in rubbish dumps on the island indicates that the natives dined on the rodents. This kept them fed while they worked at building their fields to sustain themselves long-term. A popular goofy theory about the Easter Island moai says that the massive statues were created (or, alternatively, influenced) by aliens. 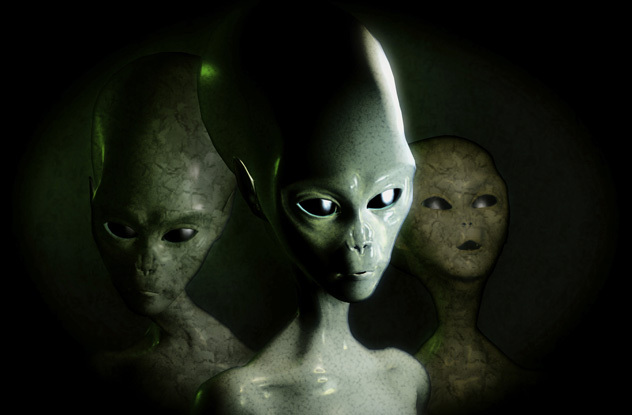 Author Erich von Daniken helped spread this theory with his book Chariots of the Gods? : Unsolved Mysteries of the Past. Daniken also believes the ancient Egyptians could not possibly have built the pyramids by themselves as they lacked the intelligence and strength. Similar theories explain the Mayan pyramids and the Nazca line drawings. The stone used to build the moai was actually taken from the island itself, from an extinct volcano on the northeastern side, not from another planet. There’s no actual mystery about who built the statues. The only real mystery is why they did so. Many island researchers fully believe that each of the statues represent the head of a family. This, however, remains speculation. In 2010, archaeologists announced that they had debunked a 50-year-old theory about how the moai were moved around the island. Thor Heyerdahl published this theory in 1958, stating that the ancient roads on the island were the islanders’ main route of transport. As evidence, moai were found facedown or on their back next to these roads, perhaps abandoned during transport for unknown reasons. Heyerdahl was disputing British archaeologist Katherine Routledge’s 1914 theory, which said the roads were built for ceremonial purposes. Recent investigation suggests Routledge was correct after all. The roads were concave, which would have made it extremely difficult to move heavy statues along them. The fallen statues simply fell over from where they were standing as time passed. 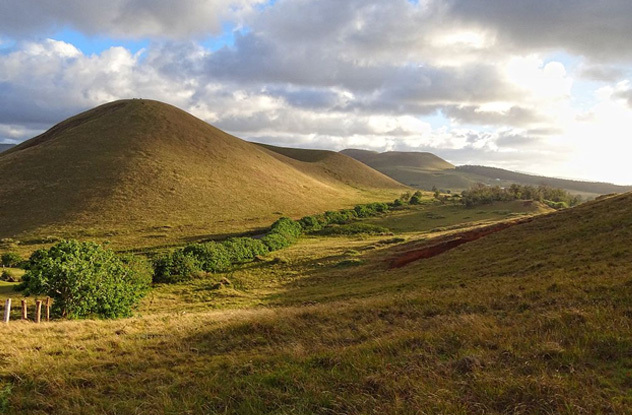 The recent archaeological team notes that the roads all lead to the extinct volcano Rano Raraku. This means that the volcano was likely seen as the sacred main point or center of the island. In what has been labeled a “wacky theory,” Robert M. Schoch claimed in 2012 that the writing system of Easter Island is actually 10,000 years older than popularly believed. This also makes the island itself older than originally thought. The man came up with this theory after exploring Gobekli Tepe, a set of ancient stones in Turkey believed to have been erected 12,000 years ago. The site bears no evidence of settlement or farming, indicating that it may have been built solely for the purpose of holding ritualistic ceremonies. Schoch also disagrees with the accepted date of the Giza Sphinx, saying that it was actually built between 5000 and 7000 B.C. This claim is completely unsupported; no evidence suggests any civilization existed or worked in the Giza area around 7000 B.C. Shoch argues that Gobekli Tepe and the Sphinx were both built by hunter-gatherers. The Gobekli Tepe pillars and the moai statues on Easter Island are almost the same, says Schoch, because of similarities in the in the style of the figures and the hands. He disregards the 12,000 years of difference between the two ancient places, and he ignores that the Easter Island heads are large while the Turkish pillar figures are thin and have no discernible heads. Shoch also believes that the rongo rongo script of Easter Island may have recorded a plasma event in the sky many thousands of years ago. Plasma in modern times refers to thunderstorms, lightning, and auroras. 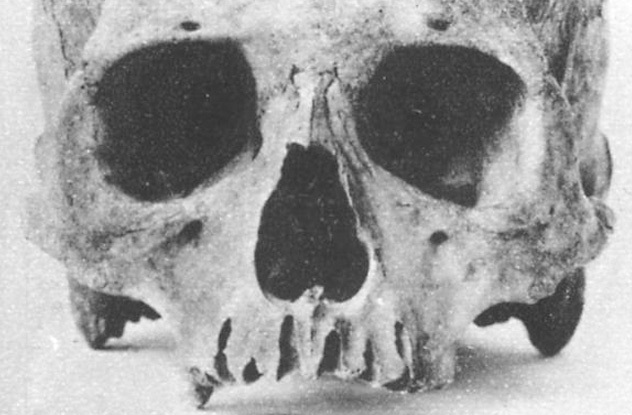 Author Rupert Ivan Murrill mentions in his Cranial and Postcranial Skeletal Remains from Easter Island that skulls found on the island were long and narrow. Evidence was also found of long ears. Aku-Aku by Thor Heyerdahl mentions a deadly fight or war between the short-eared and long-eared people of Easter Island. The story goes that the long-eared people, who’d inhabited the island first, dug a ditch around 1675 and filled it with brushwood. A long-eared man revealed to his short-eared wife that his people planned to lead all the short-ears into the ditch and burn them. The shocked short-eared woman told her people of the plans, betraying her husband to save her people. A fight broke out, and the short-eared people chased the long-eared people to the ditch. Then they burned them, women and children included. Only two long-ears survived, fleeing to a nearby cave. The short-ears followed them and killed one of them, leaving just one long-eared survivor. Heyerdahl described the long-ears as Peruvians, meaning they would antedate the short-ears, who were thought to be Polynesians. Captain James Cook visited Easter Island between 1772 and 1775 and saw many people with long earlobes, which raises some questions about the accuracy of the tale. 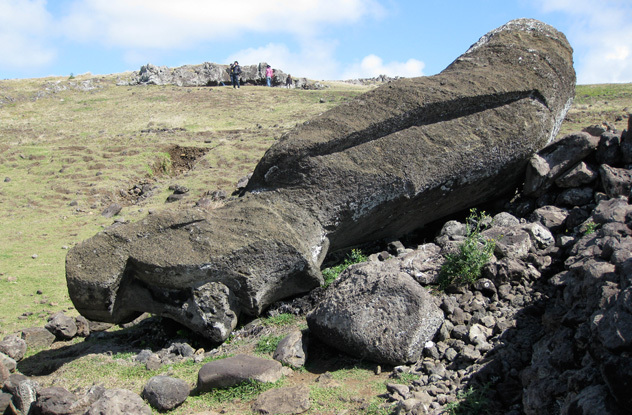 Scientists excavating around the moai statues on the island in 2011 revealed the massive stone heads to be attached stone bodies buried torso-deep in the ground. 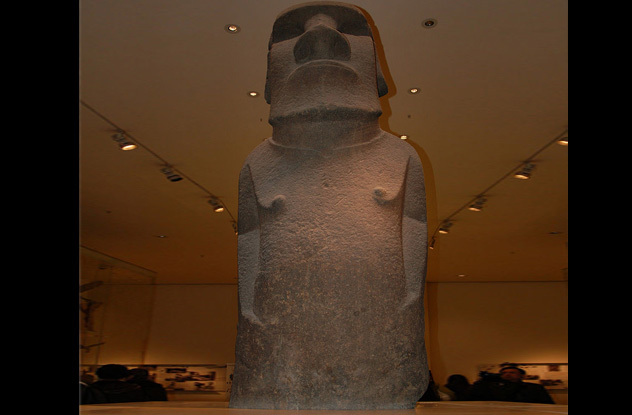 Heyerdahl had excavated one such statue decades before, and the new dig uncovered statues 7 meters (23 ft) tall. 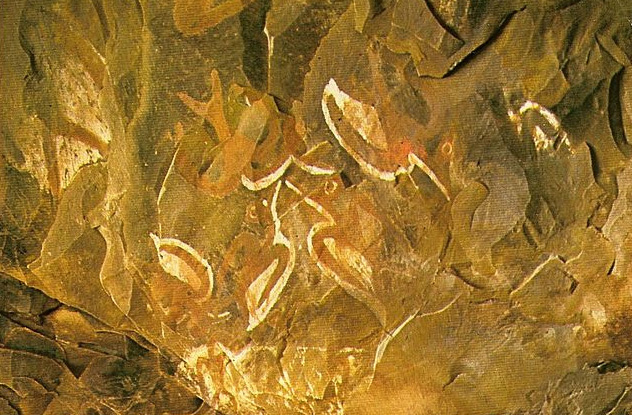 On the bodies of the torsos are undeciphered petroglyphs. The project director, Jo Anne Van Tilburg, also confirmed more interesting discoveries, including ropes connecting a statue to a tree trunk in a deep hole. Her theory is that the Rapa Nui people used the ropes and trunk to pull the statue to an upright position. Before they did this, they carved the petroglyphs into the front of the statue. After, they carved more into the back. Another fascinating discovery included red pigment in a hole used for burial. Van Tilburg is convinced that the natives used the pigment to paint the moai just as they used it to paint themselves for rituals and ceremonies. She also believes that the discovery of human bones indicates that people were buried around the statues, and ancient priests used the red pigment as part of a burial practice. The Rano Kau crater on the island, home to the Orongo village, became the site of a competition to honor the fertility god Makemake. The winner would be the person who could make it down the very steep slopes of the crater, swim in the open sea, and make it to a nearby islet without being eaten by a shark. On the islet would be an egg that needed to be brought back to the main island intact. The islander who achieved this feat was named Birdman for the year and assumed leadership. The Birdman cult became the main religion on the island up until 1867. During the time of the Birdman competition and religion, the islanders were inspired to rebuild their home and become the strong people they once had been. They didn’t succeed. During a single year, they became so infected with disease and afflicted with injury that they were left broken and unable to turn the situation around. At the worst possible time, missionaries arrived at the island and converted the islanders to Christianity. Their traditional clothes, tattoos, and body paint were history. Artwork, structures, and rongo rongo tablets were destroyed. Eventually, the Rapa Nui islanders lived on a small section of the island, while the rest of the place was used for ranching. Today, very few people remain with true ties to the original Rapa Nui people. Tukuturi is a moai statue found in a sitting or kneeling position, thought to represent an ancient singer. The position resembles that of ancient people celebrating the festival of rui. The statue’s head is inclined higher than any of its counterparts, and it even sports a beard. Tukuturi is a lot smaller than the rest of the moai statues, and its facial features are a lot more human-like. This unique statue was not made from the same material as the others. Instead, red Puna Pua stone was used. It seems to gaze toward Orongo, spurring theories that the statue was somehow connected to the Birdman cult as well. 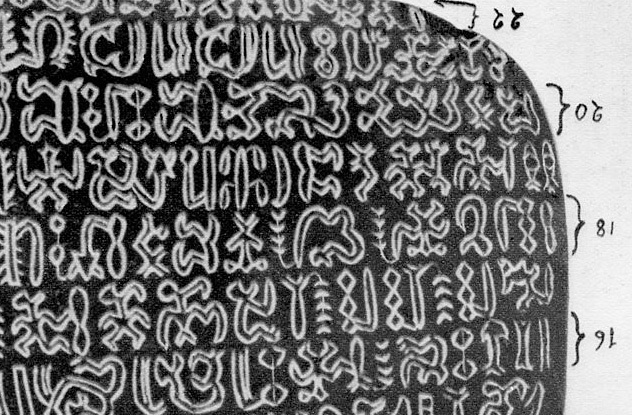 Another theory speculates that Tukuturi may be the result of experimentation with new carving techniques. The statue’s legs, knees, and buttocks are well defined, and some find the kneeling position indicative of vigilance and patience. Tukuturi was uncovered during the ’50s and remains one of the most intriguing of all the statues found on the island. Estelle lives in Johannesburg, Gauteng. She loves all things unusual and mysterious and hopes to visit Easter Island someday.